Collaboration with Artist Alan Syliboy, created during the second residency at The Art Gallery of Nova Scotia in Yarmouth, NS. Constructed from local clay sourced by ceramic artists at "The Sign Of The Whale", a gallery and collective of local Nova Scotia artists that bares the lower jaw bones of the whale at the front of their studio. Fellow "The Path We Share" Artist in Resident, Frannie Francis, was initially struck by the image of whale eyes that resulted from a search engine attempt to study whale songs. 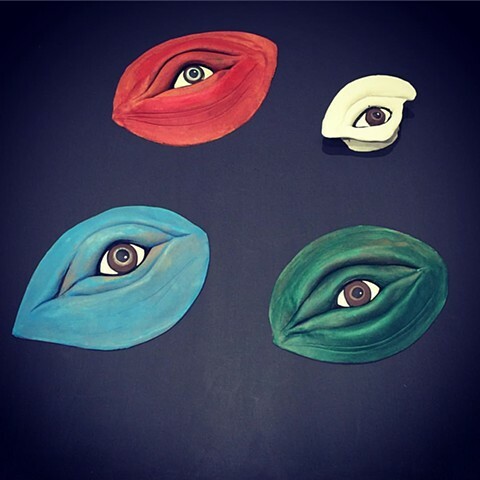 The structure of the eyes and size became a discussion that we all shared as artists during the first residency at the Deanery Project and Alan expressed interest in collaborating further on the eye of the whale. When I returned to visit with them for the second residency I created as many eyes as I could from the clay gifted to us during the week's time. After our residency was completed in Yarmouth, Alan found a local ceramic artist to fire them and later finished the surface. "The Path We Share" literally became a path we shared with conversation and local community engagement beyond the initial four participating artists.